Budget travel is the key to going anywhere for lots of families. There are ways to save big on family travel, like doing the free things while you’re there–but the hotel shouldn’t be one of them. Why? Because there is nothing worse than saving a dollar only to lose hours of sleep. Lodging is one of the major expenses while traveling; that’s why there are dozens of websites designed to help you save money on lodging! Like anything else, you get what you pay for – and sometimes that budget hotel is less than what you expected. As every traveling parent knows, sleep is sooooo important. When you have kids, it seems like you never get enough of it. So when you’re on vacation, you deserve a decent night’s rest. 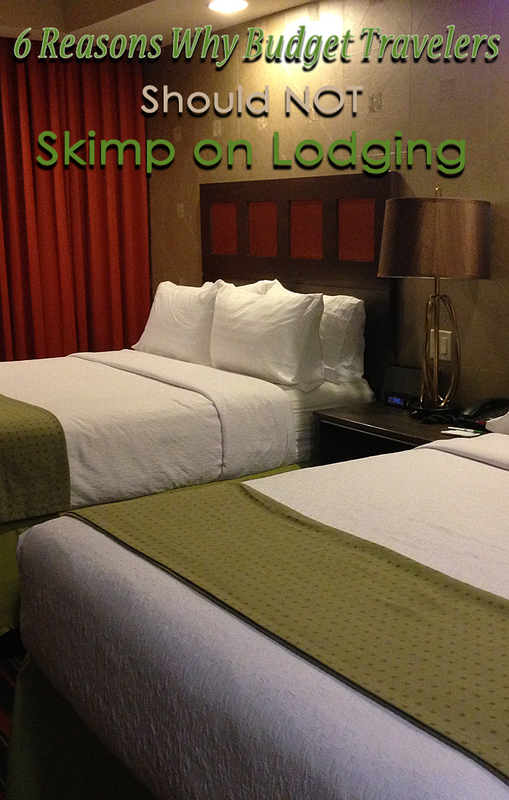 Here are five reasons I don’t scrimp on hotels even when I’m traveling on a tight budget. Sleeping safety is important when you are picking the place to lay your head down. While not all cheap hotels are located in bad areas of town, it can be hard for an out-of-towner to know which are the good areas and which aren’t so good. Military TravelingMom Meagan Shamy says safety is at the top of her list when shopping for a hotel. A good night’s sleep is worth the extra dollar. Christian TravelingMom Teroyna Holmes says she will spend more money on a hotel in order to know that she can sleep on a comfortable mattress and good sheets. Breakfast is on the hotel, Cosmopolitan with Kids Traveling Mom Anuja De Silva says that having extra amenities like breakfast or free drinks is worth paying more for the nightly fee, as you will save money on food. Anuja travels with little ones, but this becomes more and more important once your kids grow into ravenous teens. Getting them to a free buffet breakfast where they can load up on cereal and those make-it-yourself waffles can fill them up, at least for a few hours. Location, location, location is the key says Road Warrior Traveling Mom Nasreen Stump. Not having to rent a car, pay taxi fees, or ride public transportation can sometimes equal the difference in room rates. Besides, walking is the best way to really get to see an area up close. One of the main things I look for when booking lodging is what the hotel has to offer for the kids. Many places will host special events, offer free movie rental, have nice pools, and the list goes on. Sometimes these amenities are worth more to me than saving a few extra bucks. This is important if you’re traveling with little ones who will be tired at the end of the day and need to sleep by 7:30 or 8 pm. What’s a parent to do until a reasonable bed time (9pm anyone?) when a television or reading light will disrupt sleeping children? That’s when a balcony is so nice to have. Simply slip out the sliding glass doors, leaving it cracked so you can hear the kids but they won’t be disturbed by quiet conversation with your significant other. What do you look for when booking a hotel? Tell us in the comment section below.